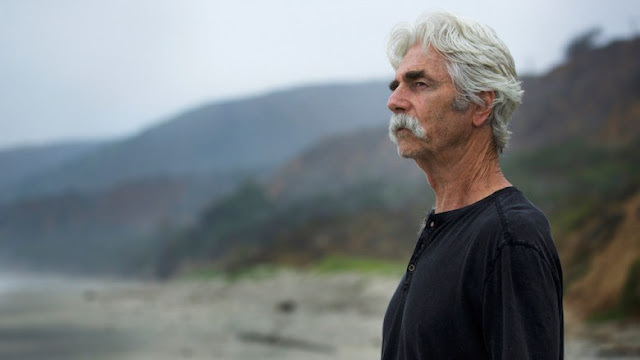 The Hero tells the story of aging Western star Lee Hayden, played by real Western legend Sam Elliott, as he deals with a cancer diagnosis and tries to land one last respectable role outside of his usual barbecue sauce commercial voice overs. The concept and casting of its star are pretty brilliant, and it seems a perfect fit for director Brett Haley, who recently directed I'll See You in My Dreams which centers on an older songstress trying to renew her career. Where the film obviously shines is in its casting. Sam Elliott gives a potential career best performance in a role that I would venture to guess was written for him. For a man nearly always cast as the stoic cowboy, Elliott shows incredible range here, from the goofy moments (getting high before giving a lifetime achievement award acceptance speech) to the heartbreaking ones (breaking down during an audition that could revive his career). Prepon, while a bit underwritten, gives a believable performance, and Offerman is fun as Hayden's friend and drug dealer in an era when Hayden could buy his weed legally. While Krysten Ritter is underused as Hayden's daughter, her impact is pretty emotional. My only real issue with the film is with its script. The first act is very loyal to the concept, but after Hayden goes viral for his bizarre acceptance speech, it begins to lack specificity; after that point, it could be the story of any aging actor with a young girlfriend. This is a movie we've seen before, and where The Hero excels is when it deviates from those tropes and accentuates the particulars of the Western theme. Despite those minor pitfalls, The Hero is an enjoyable flick with some great character moments for one of the great underutilized actors in America. While it's a drama at heart, there are plenty of funny moments as well that round it out nicely. The Hero is directed by Brett Haley and stars Sam Elliott, Laura Prepon, and Nick Offerman. It opens in theaters on June 9th, 2017.